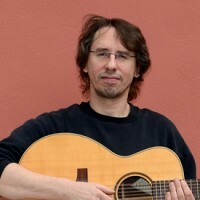 Christian Jablonski has been a master-luthier for 20 years now, living in Bad Goisern/Austria and teaching guitar building at the nearby HTBLA Hallstatt. Outside of his busy, teaching schedule he constructs wonderful guitars in his workshop. As time is somewhat limited, the output is small and most instruments are made-to-order. As a journeyman, he worked for the biggest manufacturer of steel-string guitars in Germany and, in due course, moved on to be responsible for the repair-shop in a big store. He has seen, made and repaired a lot of guitars. Now he is happy in his small shop, making excellent guitars and doing the occasional repair. "I am a guitarmaker because I love to be surrounded by guitars. I love this so much, that I became a teacher of guitarmaking now as well. There should be a greater exchange of ideas among instrument makers and I think the EGB is a great way to connect the individual guitarmakers around here. I believe the Holy Grail Show is the natural follow-up of that. It’s for sure a great opportunity to meet all the other makers!"